Meet a pool of professionals who have made a difference. Professionals in the HIM field are a vital part of the healthcare system, yet they’re typically considered more background players than front-and-center performers. That’s why For The Record makes it an annual event to salute 10 “heroes” who’ve done themselves and the profession proud without necessarily being on a national stage. Here’s a glimpse into their achievements and the stories that make them unique. As a child, Maggie Garcia was in and out of hospitals, where she got a firsthand look at the healthcare system and made the decision to pursue a career in a related field. While she was leaning toward pursuing physical therapy, a school counselor thought her profile made her a great candidate for an HIM career. She “gave it a shot,” not knowing whether it would stick. But it did, and it’s something at which she has excelled. Of course, Garcia’s HIM career hasn’t been without its challenges. One of those challenges came early in her career when she faced the task of helping implement an IT system in 90 days following a hospital merger. Lester Surrock, senior vice president and chief financial officer at Nix Health, says paper charts were being replaced, a challenge for anyone, but Garcia was a relative newcomer. Garcia deflects any praise, claiming she was merely adapting on the fly. Not long after Surrock arrived at Nix, he made a personal request that Garcia join him as assistant director, knowing he’d ultimately promote her to director. Since then, she has helped achieve compliancy and taken charge of updating forms management at Nix, an impressive feat considering there were more than 720 different paper forms in the system. Garcia traces her recent success to the start of her career when she was thrown into the fire and forced to excel under pressure while maintaining efficiency. Six years ago, Mike Brensinger started a consulting firm specializing in clinical, HIM, and revenue cycle services. He had the requisite experience, having served as assistant director of medical records at Reading Hospital in Pennsylvania and as HIM product line manager at Siemens Healthcare. e4 Services aims to accelerate installations while performing hands-on work and providing support during the entire implementation. More recently, the firm has shifted its focus to ICD-10. Brensinger says the idea behind e4 Services came when he was helping design EHR systems at Siemens. The partnership has resulted in quite a few “epic installs.” While business is booming and the company is growing, Brensinger wants the focus to remain on the customer. Michelle Cantu, supervisor of HIM at Corona Regional Medical Center in California, says Brensinger’s hands-on approach and personable disposition have made the two-year relationship between the medical center and e4 fruitful. Kelly Fast credits her mother with being the catalyst for her career. “She is my most important mentor,” says Fast, who adds that even in her mid-70s, her mother is still at the computer transcribing nearly every day. In 1989, when the medical transcription industry was arguably at its peak, Fast owned her own transcription company. 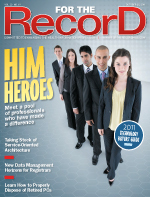 Two years ago, however, work began to decline as the effects of more widespread EHR adoption took hold. Fast was willing to adapt, although she admits it was a challenge. At first, she struggled with accepting the fast-paced changes technology was bringing to the industry. A heart-to-heart with a career mentor helped her realize the value of technology, and Fast decided to seek additional education through the master’s of HIM program at the College of St. Scholastica. Fast continues to see the value and opportunities coming down the pipeline through EHR adoption. While the future looks bright, Fast can’t help but look back at the beginning of her career. She gives credit to her husband, Roger, who was her “roadie” and “technician” in the early days. Maudy Sherer was practically destined to work in healthcare. Coming from a small community in northern California where both of her parents worked at the local hospital, she was introduced to the profession at a young age. At 15, she applied for a position in Modoc’s dietary department and has since worked her way up through housekeeping and laundry to the medical records department. She quickly transitioned from file clerk to transcriptionist, then to coder, and finally to certified medical coder. In 2005, she earned a promotion to HIM supervisor and medical staff coordinator. She has a full plate with two demanding positions but manages to make things work despite dwindling resources. She works long, hard hours but doesn’t look at it that way. Today Andrea Clark is a nationally known expert in the HIM field, but like so many others who have wound up in this industry, it was some early childhood experiences that led her in this direction. During the summer between sixth and seventh grade, Clark’s mother sent her to a medical terminology class. “I think it was just something to keep me occupied,” she says. Early in her career, Clark gained experience at several reputable firms. As she grew her knowledgebase and expanded past HIM into revenue cycle management, she unearthed a desire to provide a comprehensive service and solution for clients. That’s when she decided to branch out on her own. “It wasn’t long before I divorced myself from being an employee and began that trek of being an entrepreneur and ultimately the owner and president of a company,” she says. Clark is passionate about HIM’s future and bringing more newcomers into the field. She believes the industry needs to be guiding and mentoring future leaders considering the fact that HIM is known for its aging, retirement-gazing workforce. Clark is doing what she can to generate new interest, striking up relationships with schools to help get students excited and ready to enter the profession. Amarah Dawes knew she wanted to work in the healthcare field but wasn’t prepared to deal with tasks such as drawing blood. As a business-minded individual, the HIM industry was a perfect fit. After college, Dawes applied for an internship with the VA and sought opportunities in several states. Accepting a position in Arizona, where she spent three years, turned out to have long-lasting effects. “I had the best mentor in Phoenix who taught me everything I know today about HIM,” says Dawes. Moving quickly through the ranks, Dawes is currently in West Palm Beach, Fla., working in a fast-paced environment. Today, Dawes is the one interviewing interns and striving to be as much help to newcomers as her mentors were to her. Dawes is fully committed to expanding the scope of the HIM profession at a time of great opportunity. “Life is short. Why spend it doing something you don’t love? I like to be inspired, and I like to try and inspire people. That may not sound like something you can do with medical records, but it’s what I strive to do. I believe in this industry, and I’m 100% committed to it,” she says. In the more than 13 years Melissa Martin has served as HIM director at West Virginia University Healthcare (WVUH), she’s guided the department through enhanced work standards, technology makeovers, employee empowerment, and accountability, says Christine Metheny, RHIA, the department’s manager of technicians. Among Martin’s accomplishments is her ability to hold the HIM staff to a zero-tolerance policy for backlogs in all areas of the department—a concept she introduced in 2003. Martin says the standard was put in place at a time when the department was assessing its goals in preparation for optical imaging and before EHR implementation. The idea of developing new goals led to the realization that staff might operate more efficiently with flexible hours. Martin says implementing a more elastic schedule has made a huge difference in productivity. The new policy has kept WVUH’s delinquency rate below 12%, and transcription turnaround processes have drastically cut the time between dictation and transcription. Like many of her students, Suzanne Meiskey entered HIM as a second profession. Wanting to be involved with healthcare but not necessarily on the clinical side, HIM turned out to be a perfect fit. For 13 years, she did just that at a local hospital until a promising opportunity emerged at Montgomery College in Takoma Park, Md., where she earned the honor of becoming the school’s first HIM program coordinator. More than two successful decades later, she’s calling it a day, having influenced the lives and careers of countless students. Meiskey says that has always been one of her main objectives. Over the years, Meiskey has witnessed a slew of changes in the industry, but it’s been the rapid rise of technological advances that’s been most imposing. Still, she’s managed to keep pace with more than two decades of overhaul. For a time, Advocate Medical Group used an outside company to review charts to make certain staff weren’t missing any diagnoses. McCarty basically built the new department from the ground up. She handpicked everyone to ensure the best possible staff. Since then, the department has increased its risk score by 10% in just two years. Like others who’ve become HIM heroes, McCarty chose a career in HIM as an alternative to working directly in patient services. In fact, she started working in that arena before she realized it wasn’t the right path for her. McCarty’s caring heart is just as obvious in her behind-the-scenes work as it was during her short stint rendering direct patient care. She has become a patient advocate, making it a top priority to see that those in need receive the appropriate attention. It was practically by chance that Lori Marks stumbled on the HIM profession. After perusing a college handbook, she felt the need to find out more about what an HIM career entailed. Before long, it started to feel as if fate were calling her to an occupation that seemed to be a perfect fit. In her current role at Parkland Health and Hospital Systems, Marks manages the coding of outpatient encounters that total $1.2 million annually. A list of her achievements includes the creation of a fully functional team that began as a group of unsupervised workers; achieving and maintaining a successful drop in unbilled outpatient encounters from $18 million per day to $1.7 million; and hiring, training, and developing an in-house coding staff, a move that led to a 70% reduction in outsourced employees. On top of these accomplishments, Marks maintains an ever-present positive attitude that spills over onto her staff. Marks is cognizant of the effect her demeanor can have on a staff looking to make a difference. “I believe if you give somebody an opportunity to put their best day forward, they’ll be inspired to do better and produce outstanding work,” she says. While her HIM career may have emerged from humble beginnings in a college handbook, Marks says it’s much more than that today.